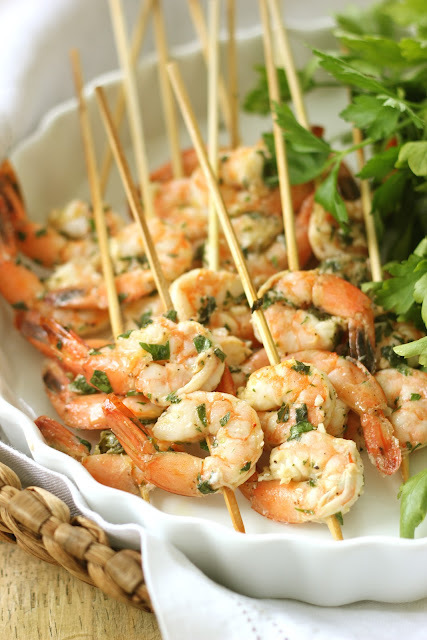 Toss potatoes in olive oil, salt and pepper before grilling. Grill for 3 minutes on each side until tender. Top with sour cream, chives and salt & pepper before serve. *You can also use baby red potatoes. 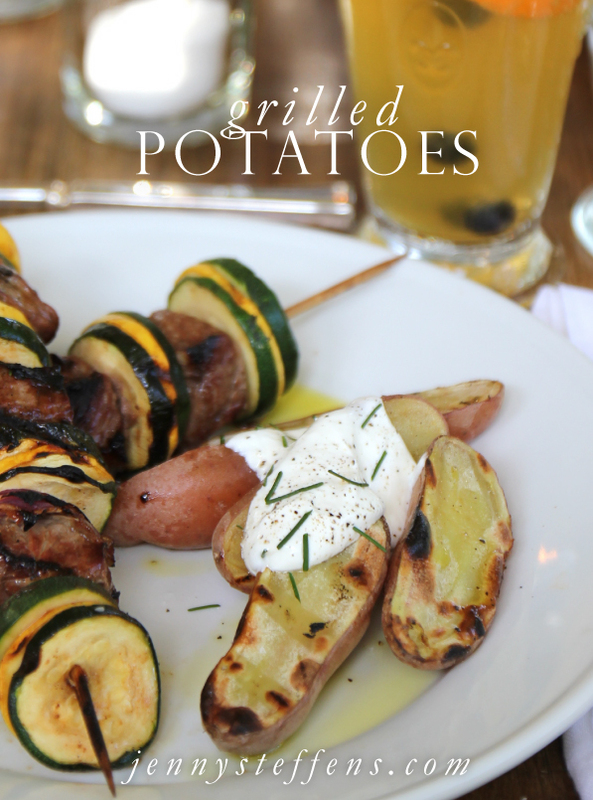 See all of the details and recipes (including those kebabs) of my Outdoor Dinner Party, here. Recently, we hosted a dinner for a dear friend of ours that was in town. As I mentioned in my "A Porch Kind of Weekend" post, I love eating out on our porch - but previously had only had casual meals on our loveseats. After writing my monthly article for MyWell-Being.com all about creative Outdoor Entertaining, I was itching to set a complete table outside... so, I pulled our dinning room furniture out onto the porch for a magical dinner alfresco. Read more of my Outdoor Entertaining tips and inspiration in my recent post on MyWell-Being.com. 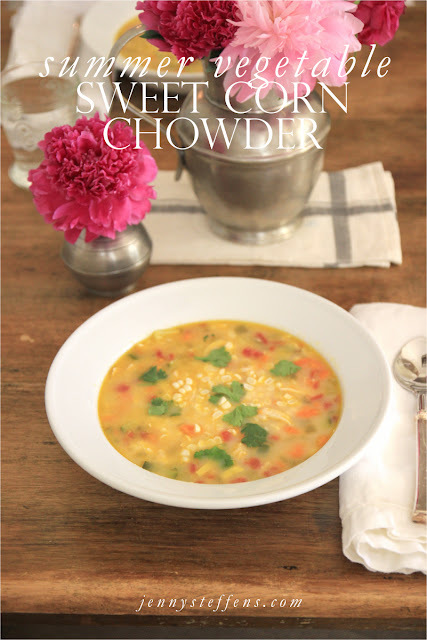 Stay tuned next week for the recipes! I love wheat beers. During the summer I'll take a cold wheat beer with a slice of orange over a glass of wine any day. For this party, I used Boulevard Wheat Beer, fresh squeezed orange juice, vodka and blueberries for a new twist on a Summer Brew (usually vodka lemonade + beer). For dinner, we grilled steak and vegetable kebabs marinated in a brown sugar, sesame and garlic marinade. I'm not sure how I just figured this out - but... did you know you can grill potatoes? They take no time at all and have a great smokey flavor. Blue hydrangea are my summer favorites and happen to be blooming in masses everywhere this year because of all of the rain. I miss my big hydrangea bushes in our old house and have settled on planting them in our urns on the front steps this year. A big bunch of hydrangeas is my favorite "non-arrangement" floral arrangement. 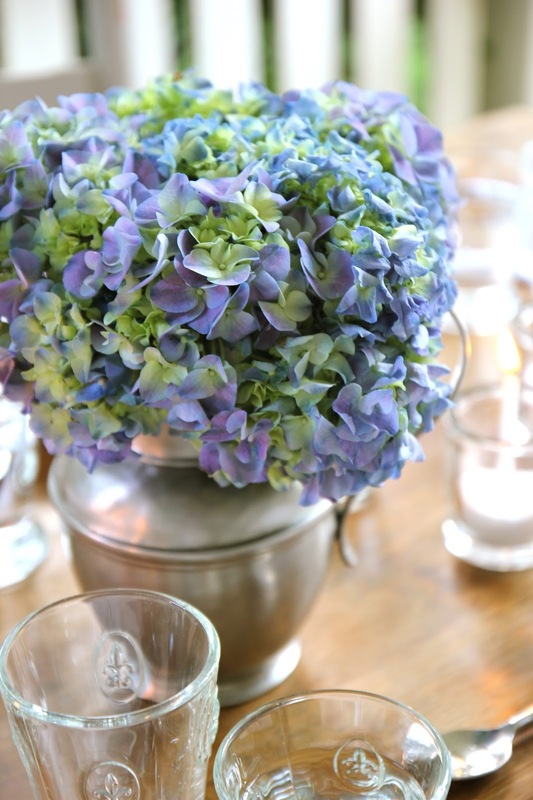 Unlike other flowers that look great mixed with others, hydrangea are meant to be on their own bountiful in bunches - they set a sophisticated yet casual tone. I have these in a Match Pewter vase, a wedding present that we've gotten soooo much use out of. Here is the view of the table from the dining room, just outside the french doors. The scene - just as the sun was setting and just before our guests arrived. I love these Celebration candles. 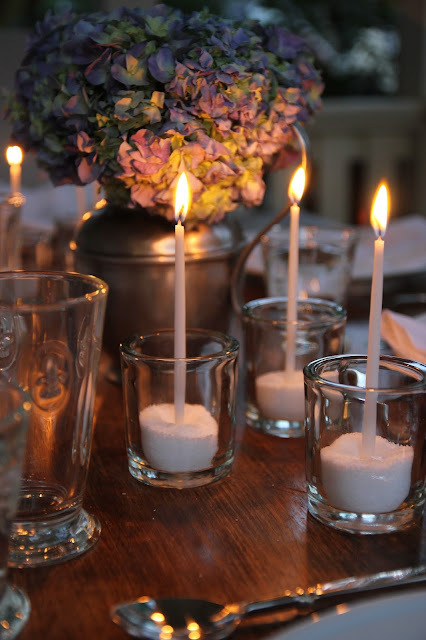 I used small, thick-glassed votive holders with sea salt to hold the candles. Aren't they magical and very chic? Stay tuned for the recipes to come! 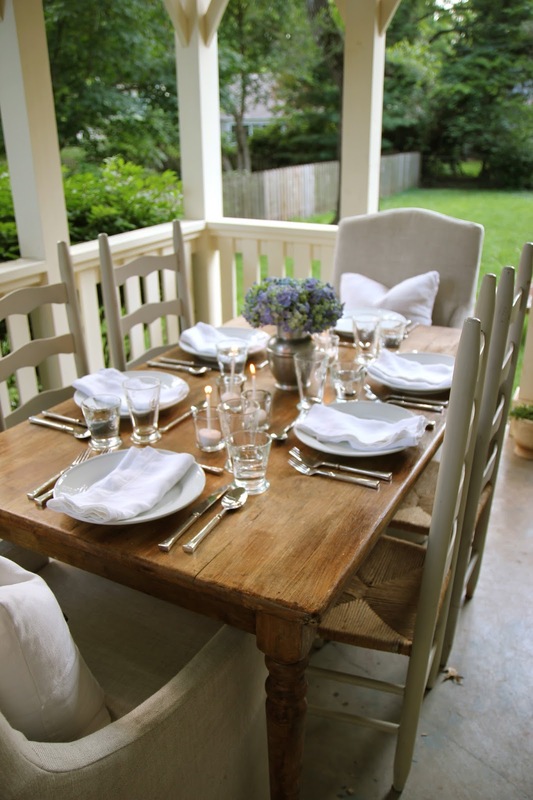 Don't forget - I've shared more of my Outdoor Entertaining tips and inspiration in my recent post on MyWell-Being.com, read the article here. ***Update : The winner is Morgan! You can read her story below in the comments section. Morgan - please send me an email (jenny@jennysteffens.com) and we can arrange the delivery of your new pair of shoes (or gift card)! 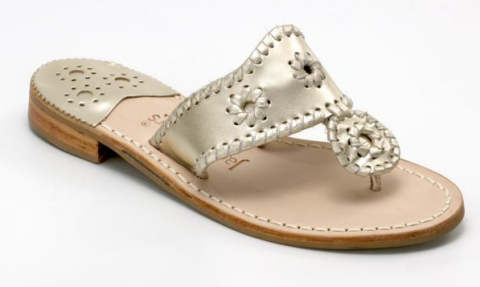 or the staple J.Crew gold Capri flip flops. So, I keep debating... Do I really need loafers in June? I mean, it is not that big of a deal - only $100. At least they aren't the Tory Burch loafers I had originally had my eye on... Maybe I should wait for Fall. "We especially need women's athletic shoes." These are not ladies that need driving loafers or ballet flats to wear to drop her kids off at daycare so she can run errands, or have something new and fresh for date night, these are women that need comfortable shoes so they can work. On their feet all day long. So they can show up for a new job (or interview) and feel good about how they look and be comfortable - and make a life for themselves and their children. The long row of multiple colors of ballet flats, flip flops, running shoes, tennis shoes, uggs, house shoes, heels, loafers and boots in my closet have haunted me since I saw this note. I don't know about you, but I'm most moved when I hear something specific - we all remember when Oprah asked her audience to donate children's pajamas to her foundation. The thought of sweet little children that didn't have a pair of pajamas to put on at night (much less multiple outfits to wear to school the next day) moved so many mothers to help pitch in. So many of us want to help, but to often we're not to sure how. So, here's the fun part. I'm going to help you help others... then I'm going to help you, again. Donate to one of my favorite (or your own) Women's Charities, and you're entered to win a new pair of shoes (featured above...) from ME! You can choose from the C.Wonder Drivers, Jack Roger Navajos or a $100 gift card from J.Crew. 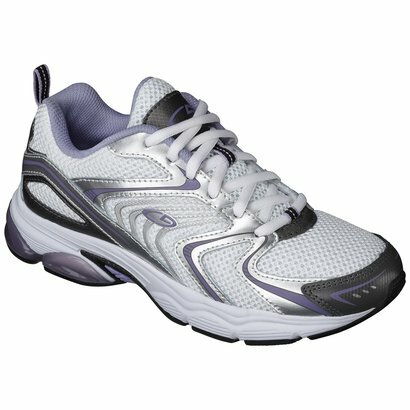 This pair of shoes from Target.com costs about $25. Attn : Ladies We Respect! -Confirm that you have purchased the shoes and had them shipped! - Share a small story about how shoes have helped you feel great at some point in your life. -Share which pair of shoes you want ME to buy YOU - the Jack Rogers Navajo, J.Crew $100, or C.Wonder Driving Loafers. -Confirm that you have made a donation (no need to share how much)! -Share a small story about how shoes have helped you feel great at some point in your life. *These are local KC charities, so please feel free to donate to a local charity in your area - I just wanted to make it easy if you didn't know of a local charity... after all, ladies are ladies, am I right, ladies? At random, I will select the winner of my gift from the comments! I will make the announcement on the blog NEXT WEDNESDAY, June 18th! Please check back then to claim your prize. I'm so excited to be doing this on my blog - it is a new area for me, but something that is going to make this blog a true extension of the life I hope to lead... helping everyone make Everyday Occasions special. PS - normal well wishing comments are also welcome, as always! I'm constantly looking back at my old recipes to give myself inspiration for the night's dinner... I thought you might be doing the same thing! 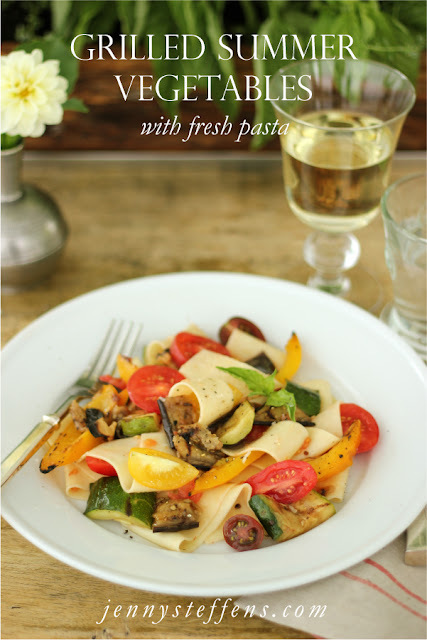 So, here is a compilation of some of my favorite summer dinners from the past couple of years - kebabs, skewers, steaks, soups and pasta. Don't forget to pin so you'll know where to look next time you can't decide what to have for dinner. This salad is my new obsession - I've made it almost 5 times in the last week. It is sweet, but sharp and completely delicious. 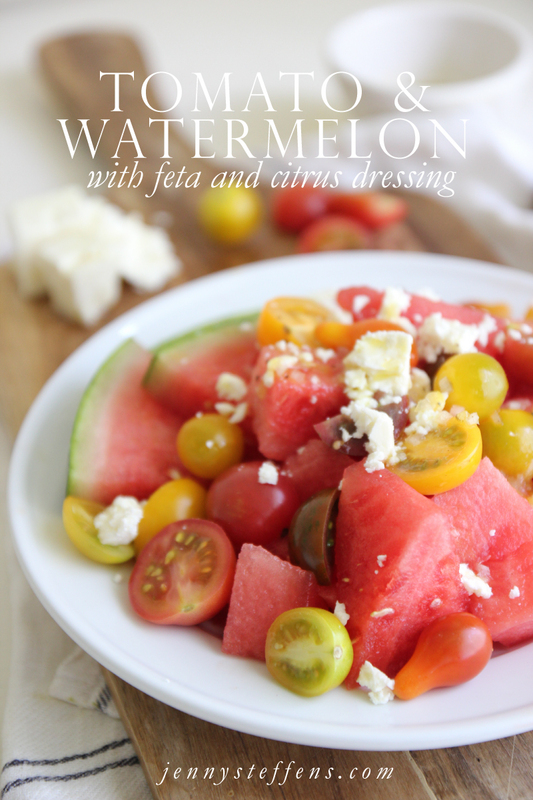 It goes perfectly with a burger, kebabs or grilled shrimp... all of which we've had this week with this very salad! Whisk together the lemon juice, shallots, sugar, salt, and pepper. Slowly pour in the olive oil, whisking constantly, to form an emulsion. 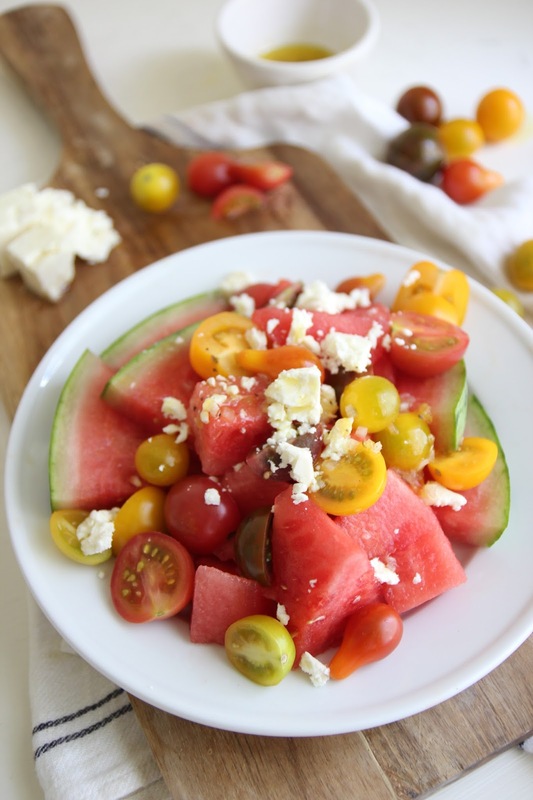 Place the tomatoes, watermelon and feta in a large bowl. Drizzle with enough vinaigrette to coat the lightly and toss well. 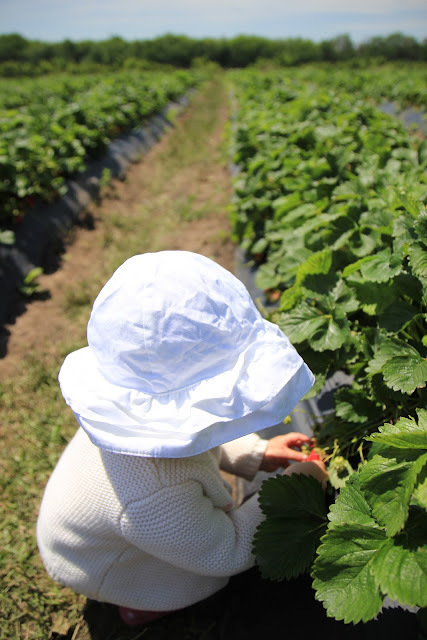 Summer's really not complete without a trip to the strawberry patch. For the last two years, I competed in the Verrill Farm Strawberry Recipe Contest (which I never won...), but now that we're back home I wasn't sure where we'd go for picking. Emma is just ripe for the picking age! Children are welcome at strawberry patches - they are just the right height. 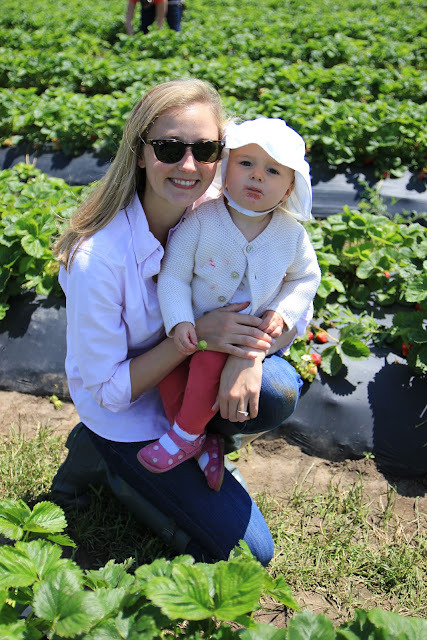 It was so fun to see her get to explore and run and pick and eat without having to constantly tell her "no." 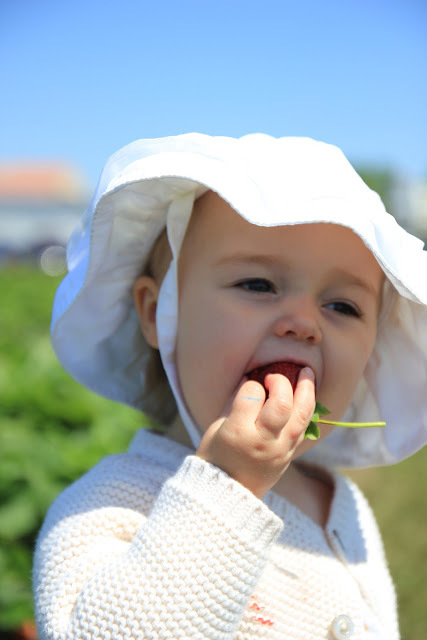 When I was young I was crazy for strawberries. I've shared this photo before, but it really is worth sharing again. Here I am on my 2nd Birthday - complete with a "Strawberry Shortcake" cake and a punkin' pie haircut... looking so much like my Emma. 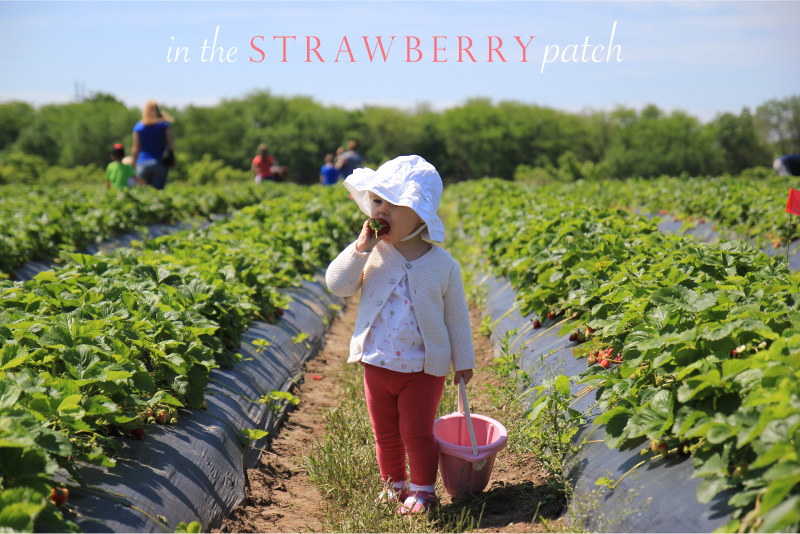 Enjoy our photos from our day in the Strawberry Patch! At least once a week I try to find an activity that is all about Emma. ...play with anything but her toys, spray the windex, or run around Target like a madwoman. Both of us have so much fun when we do things and go places where she can have free rein and do whatever she wants to do without me holding her back. ...or make her pose, or try to get the perfect shot of her smiling. I just let her be and do whatever she wants to. She has a great time and I'm usually rewarded with a big smile... and very long nap-time in the afternoon!